After our day in Montreux, we stayed in a city called Sion. We didn’t do much touring there, but it’s a cool little city with two big hills that have castles on them, and then the city surrounds them. We did get some cool pictures. Unfortunately, as we were leaving the city, our car bumped another persons in the parking garage. Luckily, he came out of the mall we were parked at pretty soon after it happened, and was VERY cool about the whole situation. Little scary as it was a BRAND new rental car, and now had some scratches on it. Luckily again, the rental company didn’t charge us for it and we ended up being just fine in the end! My brother snapped this photo as we were trying to speak to the guy about the situation - in French of course. Luckily my brother and his wife are fluent! 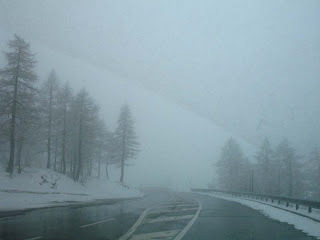 We drove to this town in the Alps where you could take a train up to Zermatt. It’s a ski resort town with a really neat view of the Matterhorn. Because it’s mostly a ski town, only permanent residents are allowed on the road that takes you there – but the train ride was beautiful. 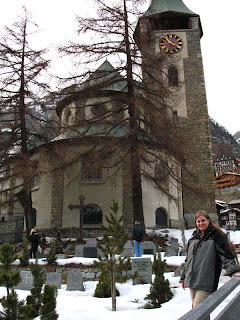 There was a really neat cemetery there for people that had died trying to climb the Matterhorn and a few other surrounding giant mountains. It was kind of sad because a lot of them were in their late teens, early twenties. 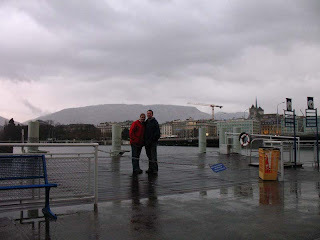 We spent some more time in the cities that surround Lake Geneva. 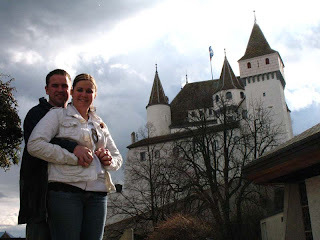 This castle was in a town called Nyon. 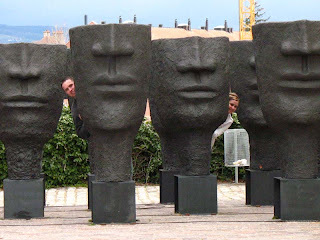 The courtyard in front of the castle had these strange face sculptures – Weird! 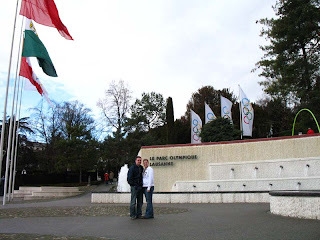 We also went to the Olympic Museum in Lausanne. They mostly had a bunch of statues and things commemorating all of the places where the Olympics had been. Our last stop in Switzerland was Geneva. It was a pretty rainy day, so we didn’t get a whole lot of pictures. We mostly shopped for souvenirs in the market places. 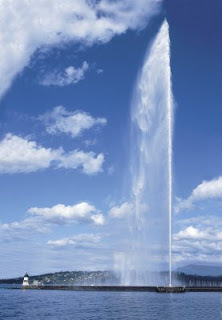 The Jet d’eau was shut off when we were there – it’s a big water fountain that Geneva is famous for. I put a picture of what it’s SUPPOSE to look like, even though we didn’t take it. After bidding my brother and his family farewell, we made the drive over the Swiss Alps into Italy to continue the rest of our trip on our own. We encountered quite the storm as we were nearing the peak of the mountain we drove over. It was a little scary, but made for a cool picture. Once again, amazing pictures! 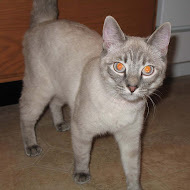 Are you coming to card swap? I want to go to Switzerland. They are neutral. :) I tagged you. Go to my blog for details.